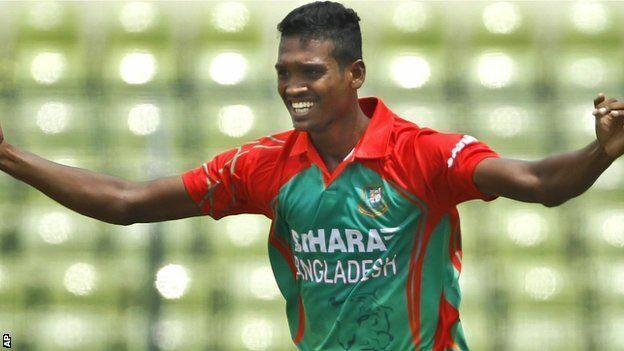 Al-Amin Hossain (born January 1, 1990 in Jhenidah, ) is a First-class cricketer. He plays for Barisal Burners in the Bangladesh Premier League. He took 12 wickets for Khulna crushed Chittagong by eight wickets in Jessore in 2011. He first ripped through the Chittagong lower order in the first innings, in which they scored just 200 runs, before leaving an even bigger impression in the second innings. Al-Amin finished with 7 for 36 in the second innings, with Chittagong getting bowled out for 144 runs. He took figures of 9 for 58, helping Khulna kicked off the second phase of the National League with an eight-wicket win over Rajshahi in a low-scoring encounter that lasted just two days at the Narayanganj Osmani Stadium in Fatullah. In 2012, he was selected to Bangladesh “A” squad to play against England Lions. In first unofficial ODI he took wicket of Joe Root, James Taylor and James Vince as England Lions where reduce to 38 for 4. In 2013, he took 6 for 16 for Abahani Limited as rolled over Cricket Coaching School for a paltry 35 to record a 212-run win in the Dhaka Premier League. He was in the forefront of all the carnage as he picked up all of the top five batsmen inside the first 11 overs. He was added to Bangladesh Test squad for New Zealand series and he made his Test début in Mirpur Test.